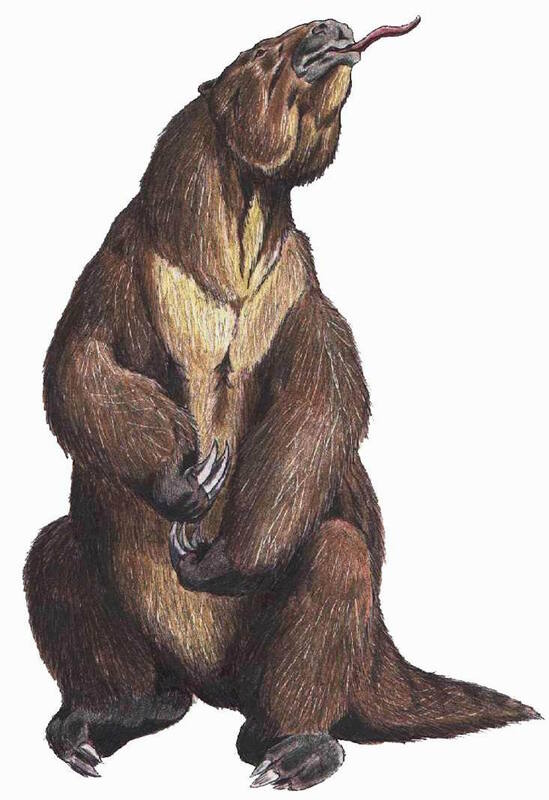 Megatherium [megg-uh-THEER-ee-yum] from the Greek μέγας (megga) = “great” + θηρίον (theer-ee-yon) = “beast” was a genus of elephant-sized ground sloths native to South America that lived from the Early Pliocene through the end of the Pleistocene. Its size was exceeded by only a few other land mammals, including mammoths and Paraceratherium. This drawing was performed by ДиБгд, who has released it into the public domain. The Megatherium Society exists to collect, analyze, and disseminate information on the natural sciences. The Society conveys information from members, who graciously supply photographs, drawings, and textual descriptions of their everyday encounters with nature, to its team of dedicated analysts who combine it with inputs from academia, scientific journals, scholarly papers, and reviews from scientists and technicians in the field. That done, the processed information is used to prepare articles for publication on the Society’s open-access viewer-participant websites. The Society’s websites, BugsInTheNews, BudsInTheNews, BodsInTheNews, (and, soon to come, are ChemInTheNews [news about organic and inorganic chemistry], HerbsInTheNews [news about herbs, organic gardening, terpenes, herbal extracts, and related topics], and more) are accessible to all who have the ability to access the Internet. The Society will also soon begin to e-mail, to its official membership, a periodic newsletter describing new articles, subjects under present research, and calls for papers and information on specific topics of present interest and concern. The Megatherium Society was founded in the first decade of the new Millennium, taking its name from the same ancient animal that inspired the Megatherium club, an informal assembly of scientists that flourished during the mid-19th century in Washington D.C.. Coincidentally, as was the case with most of the members of the Megatherium club, a significant fraction of those who contribute materials for publication on the Society’s websites are not formally educated in the sciences. Inputs from those so educated are greatly appreciated, but the Society encourages, and gives equal attention to, inputs from children, amateur scientists, and from adults having little or no formal scientific education whatever. In so doing, the Society promotes the unfettered observation and documentation of nature, in all her various departments. The Society claims but one devotion, to the immortal spirit of Veritas, i.e., the cause of Truth. That devotion is circumscribed only by the good and proper bounds of prudent scientific inquiry. Thus the Society’s object mirrors the declaration made by William Stimpson, founder of the 19th century Megatherium club, when he dedicated himself and his fellows to seeking truth on a path illuminated solely by those investigatory tenets peculiar to the sciences. Individual membership categories are described on the Society’s membership page. Funding for basic Society operations — i.e., skeletal website maintenance and upkeep — is provided by EntomoBiotics Inc., an environmental consulting firm dedicated to applied research in all the natural sciences. All other Society programs are funded via donations by interested benefactors. The programs undertaken by the Society are thus circumscribed by the natural limits of ordinary economics, according to the funds at the Society’s disposal.